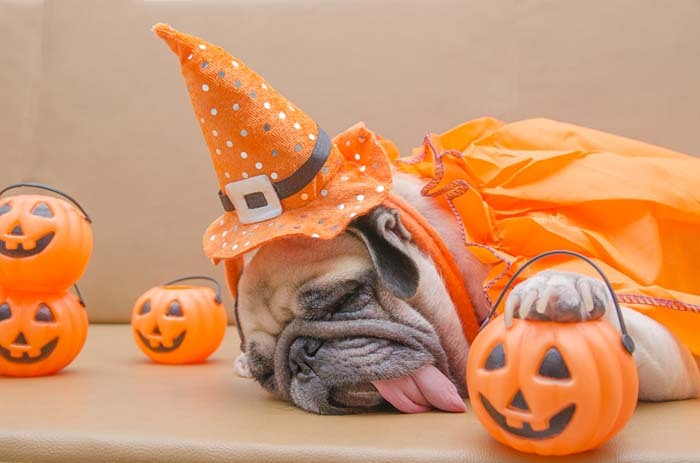 With Halloween a few weeks away, every pet parent should keep these Halloween hazards in mind so that this fun night won’t be ruined for anyone, including the dog. Halloween is an enjoyable and festive time for families. But if you have a pet dog, next to July 4th this night might become the second scariest time of your dog's life. Here are 15 dog safety tips to apply for Halloween to keep your pups calm, safe and secure. There's going to be plenty of action and commotion happening on the night. In case your dog slips out of the house or gets away from his leash when on an evening Halloween walk, make sure that your pup has a proper ID tag with your name and contact number to appease your worries. Or, better yet, get your dog microchipped or update the details of this chip in the system a few days before Halloween. Hyperactive and energetic dogs are more likely to get stressed over the sounds and actions going on during festivities. Give your dog enough exercise time during the day so that he won't get restless, unusually active and curious about the sights and sounds from the people celebrating Halloween at night. Proper playtime and good exercise routine will help him to keep calm. If he's had a good day at the park, he might be too tired and sleep the night off. Will your dog be joining the Halloween celebration? It's better to do a practice run a few nights before Halloween to see how his dog Halloween costume works. A good pet costume should not obstruct your dog's sight or ability to breathe and move. Or, it might be better to ditch the whole costume idea altogether since dogs aren't exactly fond of dressing up, according to animal behaviorist Alexandra Horowitz via the New York Times. There's going to be plenty of goodies that dogs may want to consume but shouldn't. Bring some dog-friendly and healthy treats with you if you're trick or treating with your furry best friend. This way your four-legged Halloween sidekick is less likely to accidentally eat the candies that kids sometimes drop on the ground. Keep a sharp eye on those too and make sure your dog never consumes things he's not supposed to. All the commotion can be distressing for your pooch. Keep the dog on a short leash at all times when you're out for your Halloween walk. He has to be close to you so that you can easily swoop him up if there are too many people around. Watch out for any signs of stress that your dog might exhibit. He might be tempted to run off if he sees too many people in weird and scary costumes, and he won't be able to handle the sensory overload. If you notice your dog behaving differently, it's best to take him back home as soon as possible. Speaking of candies, never leave any Halloween stash in areas where your dog can easily reach, such as the chair or coffee table. Don't underestimate your pet's ability to sniff out and open those chocolate candy wrappers. Most of these candies contain toxic ingredients that will make your dog severely sick and festivities is the most common time that dogs get poisoned, according to veterinarians. Similarly to Christmas decorations safety, if you're decorating your house for Halloween and you have a dog that wants to chew on everything, it's better to strategically place the items where he won't be able to reach them. Alterantively, you can buy and use dog-safe decorations. This way he won't do any damage to your things and he won't harm himself too by consuming fake spiderweb or plastic pumpkins. While pumpkin itself can be beneficial to dogs, uncooked decorative pumpkins are going to cause an upset stomach if your dog tries to eat them. These decorations might contain mycotoxins that are poisonous to dogs, which can lead to neurological problems among other health issues. Don't set yours down on the ground or floor next to these things, and keep an eye out for your pup in case he starts sniffing the neighbor's pumpkin decorations. In the same way, keep lighting Jack-O-Lanterns, as well as a battery or electronically powered decorations out of the dog's reach. Same as with Christmas decoration safety, many pets are curious to test their teeth on them. Your pup could easily chew or pee on these if it's set too low. These fixtures may short circuit and accidentally burn, cause damage or harm to the dog or people in the house. As much as glow sticks look fun, they're not safe for dogs. The liquid that makes the glow is toxic to pets, so never put this on your dog no matter how cute it looks on him. They contain dibutyl phthalate (DBP) and they can easily be broken with a single bite. When consumed by the dog, it'll result in profuse drooling, retching and gagging. The streets will be filled with kids and adults dressed in odd costumes during the Halloween night. If you have an overly excitable or hyperactive dog, it's best to keep your little buddy indoors (preferably well-exercised and tired) so he won't be barking at everyone passing by your house. 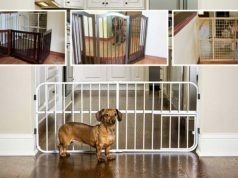 Depending on your dog's temperament, sometimes it might be necessary to confine the pet further in another room or better yet his dog crate for a short (specific) period of time while Halloween night is still active. Since you're going to be opening and closing the main door for a lot of trick-or-treaters, your pooch is more likely to be exposed to stress signals or other dangers. While fireworks – a dog's worst nightmare – are not as common, some dogs begin reacting negatively when the doorbell rings too often, and on Halloween night it's going to be impossible to control this noise. Perhaps turn on the TV loud enough in the room where you're confining your dog so that the noise from the doorbell won't drive him crazy, or use other dog calming techniques like white noise machine or calming music. Before the Halloween night is over, don't forget to clean up the candy wrappers, easily accessible decorations and other Halloween stuff that your kids might leave in the kitchen or living room. The dog is likely to try to eat anything that looks new and interesting, which is likely to land him in the vet clinic. Awesome, awesome. I love this article. It is so funny and full of great ideas… Thanks for sharing!